CMG Detailing is a licensed dealer & factory-trained installer for XPEL, STEK & SunTek clear bra paint protection films. 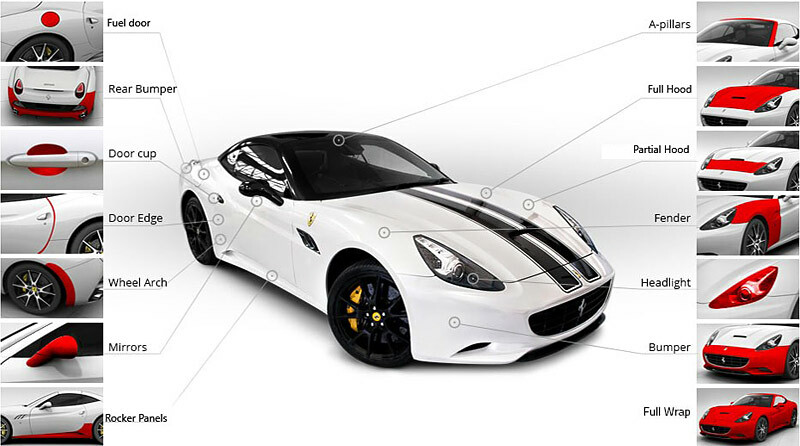 XPEL, STEK and SunTek Clear Bra aka Paint Protection Product films protect the leading edge of your vehicle against the damage caused by rocks, gravel, salt, or insects, through the application of a thin and virtually invisible urethane paint protection film. These Ultimate Films are self-healing, have an unparalleled gloss finish (or a matte finish), and carry a 10-year warranty against yellowing, cracking, peeling, staining, and hazing, covering both film and labor. Many of today’s high performance/high end cars are styled with wide, flared front fenders, air intake hood vents, and sculpted front bumpers. While these features are functional and attractive, they pose significant challenges to even the most experienced installer. CMG Detailing offers a pattern for virtually every make on the road. Every pattern is laser designed and model-specific for a perfect fit every time, with no need to cut on the vehicle. Some models have such a demand that patterns are designed to cover the entire vehicle. If there isn’t a pattern available, we can install custom kits from bulk film. If you have or are thinking of buying a new vehicle of any model, whether it’s a daily driver, exotic, truck, minivan, or any high end vehicle, why not ”Drive a new car every day” and ”Protect your investment” before paint damage occurs. We have a paint protection film to keep you covered —no matter what you need to protect. If you are interested in seeing what paint protection film can do for your vehicle, call us at (414) 467-9094 or request a consultation. CMG Detailing wrapping a new Audi S8 with Xpel Stealth paint protection film.